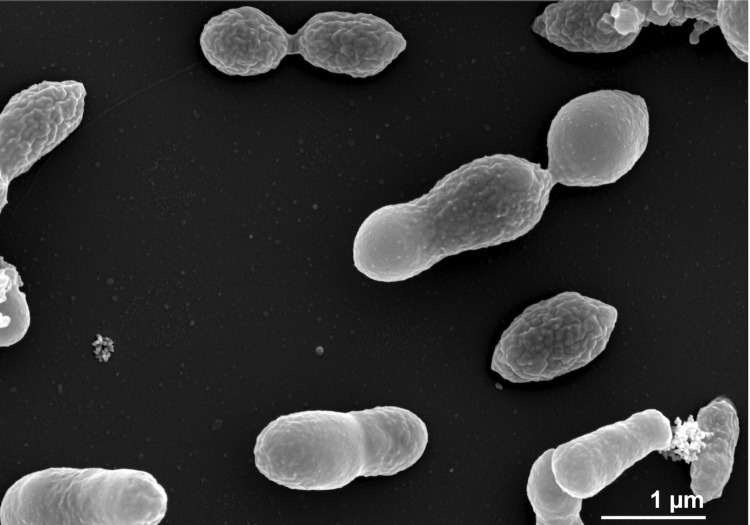 Leisingera nanhaiensis DSM 24252T is a Gram-negative, motile, rod-shaped marine Alphaproteobacterium, isolated from sandy marine sediments. Here we present the non-contiguous genome sequence and annotation together with a summary of the organism's phenotypic features. The 4,948,550 bp long genome with its 4,832 protein-coding and 64 RNA genes consists of one chromosome and six extrachromosomal elements with lengths of 236 kb, 92 kb, 61 kb, 58 kb, 56 kb, and 35 kb, respectively. The analysis of the genome showed that DSM 24252T possesses all genes necessary for dissimilatory nitrite reduction, and the strain was shown to be facultatively anaerobic, a deviation from the original description that calls for an emendation of the species. Also present in the genome are genes coding for a putative prophage, for gene-transfer agents and for the utilization of methylated amines. Phylogenetic analysis and intergenomic distances indicate that L. nanhaiensis might not belong to the genus Leisingera. The genus Leisingera was proposed by Schaefer et al. in 2002  and belongs to the family Rhodobacteraceae within the class Alphaproteobacteria. The genus currently consists of three species with validly published names, with Leisingera methylohalidivorans as the type species. The genus was named in honor of Thomas Leisinger on the occasion of his retirement and for his contributions to our understanding of the biochemistry of bacterial methyl-halide metabolism. NH52FT (= DSM 24252T = LMG 24841T = ATCC BAA-92T) is the type strain of L. nanhaiensis and was isolated from marine sandy sediment taken from the South Chinese Sea . The species name is referring to Nanhai, the Chinese name for the South China Sea. The other two Leisingera species were isolated from seawater and a marine electroactive biofilm, respectively [1,3]. All three Leisingera species are able to grow on methylated amines as the sole N source  and, at least for L. methylohalidivorans, the ability to grow on methyl halides as sole carbon source was described . Here we present a summary classification and features of L. nanhaiensis DSM 24252T, together with the description of the non-contiguous genomic sequence and annotation. A representative genomic 16S rDNA sequence of L. nanhaiensis DSM 24252T was compared with the Greengenes database for determining the weighted relative frequencies of taxa and (truncated) keywords as previously described . The most frequently occurring genera were Phaeobacter (51.0%), Roseobacter (20.2%), Silicibacter (7.6%), Leisingera (5.5%) and Nautella (3.9%) (75 hits in total). Regarding the four hits to sequences from other species of the genus, the average identity within HSPs was 96.7%, whereas the average coverage by HSPs was 99.4%. Among all other species, the one yielding the highest score was L. methylohalidivorans (NR_025637), which corresponded to an identity of 96.8% and an HSP coverage of 100.1%. [Note that the Greengenes database uses the INSDC (= EMBL/NCBI/DDBJ) annotation, which is not an authoritative source for nomenclature or classification.] The highest-scoring environmental sequence was AJ296158 (Greengenes short name 'Spain:Galicia isolate str. PP-154'), which showed an identity of 96.3% and an HSP coverage of 100.0%. The most frequently occurring keywords within the labels of all environmental samples that yielded hits were 'microbi' (7.7%), 'marin' (7.3%), 'water' (7.0%), 'coastal' (6.6%) and 'effect' (6.6%) (168 hits in total). Environmental samples that yielded hits of a higher score than the highest scoring species were not found, indicating that this species is rarely detected in the environment. Figure 1 shows the phylogenetic neighborhood of L. nanhaiensis in a tree based on 16S rRNA gene sequences. The sequences of the two identical 16S rDNA copies in the genome do not differ from the previously published 16S rRNA gene sequence (FJ232451). 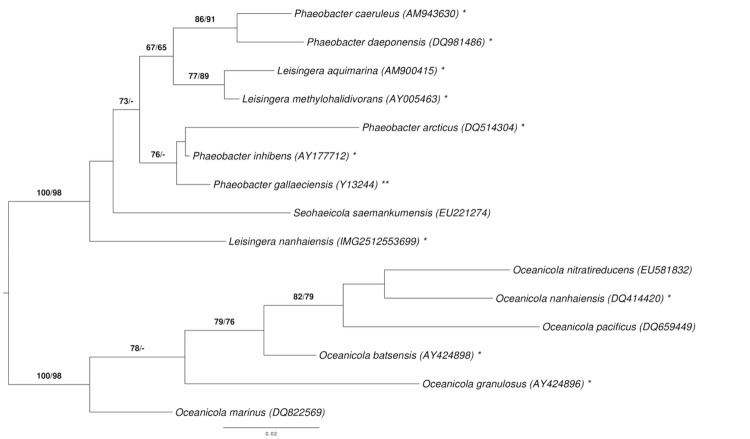 Phylogenetic tree highlighting the position of L. nanhaiensis relative to the type strains of the other species within the genus Leisingera and the neighboring genera Phaeobacter, Oceanicola, and Seohaeicola [1-3,6-16]. 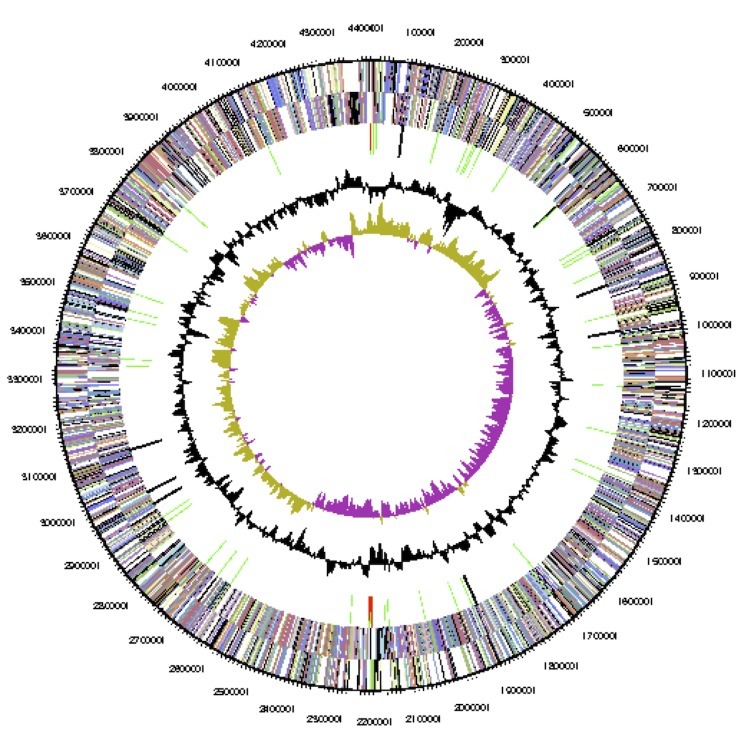 The tree was inferred from 1,385 aligned characters of the 16S rRNA gene sequence under the maximum likelihood (ML) criterion as previously described . Oceanicola spp. were included in the dataset for use as outgroup taxa. The branches are scaled in terms of the expected number of substitutions per site. Numbers adjacent to the branches are support values from 1,000 ML bootstrap replicates (left) and from 1,000 maximum-parsimony bootstrap replicates (right) if larger than 60% . Lineages with type strain genome sequencing projects registered in GOLD  are labeled with one asterisk, those also listed as 'Complete and Published' with two asterisks [10,18-23]. Our phylogenetic analysis (Figure 1, Table 1) indicates that L. nanhaiensis is not particularly closely affiliated with the other Leisingera species. BLAST results against the NCBI database with the 1,429 bp long 16S rRNA gene sequence showed 97% similarity to L. methylohalidivorans strain MB2, Phaeobacter gallaeciensis DSM 17395 and P. gallaeciensis 2.10 (see also the Greengenes analysis described above). Thus a reclassification of L. nanhaiensis might be appropriate, but should probably be postponed until more genome sequences from the relevant genera are available, as the 16S rRNA gene trees are only partially resolved (Figure 1). A preliminary phylogenomic analysis is given below. Classification and general features of L. nanhaiensis DSM 24252T according to the MIGS recommendations  published by the Genome Standards Consortium . Evidence codes – TAS: Traceable Author Statement (i.e., a direct report exists in the literature); NAS: Non-traceable Author Statement (i.e., not directly observed for the living, isolated sample, but based on a generally accepted property for the species, or anecdotal evidence); IDA: Inferred from Direct Assay. Evidence codes are from the Gene Ontology project . L. nanhaiensis NH52FT was originally described as an aerobe , but as genes for the dissimilatory reduction of nitrite could be found in the genome of DSM 24252T (see “Insights into the genome”) the organisms has the genetic potential to be a facultative anaerobe. Cells of strain NH52FT are Gram-negative, motile rods, 0.62 – 0.8 x 1.6 – 2.96 µm in size . Figure 2 shows a scanning-electron micrograph of L. nanhaiensis DSM 24252T. NaCl is essential for growth, which occurs from 0.6% to 6.0% NaCl with an optimum between 1% and 4% . The temperature range is 4°C – 37°C (optimum 25°C) and the pH range is 6 – 9.3 (optimum 7 – 8.5). Growth only occurs on complex substrates such as yeast extract, tryptone and peptone from potatoes, as well as betaine and methionine . The color of the colonies grown on complex medium (M2 agar medium) is beige. The type strain is susceptible to a broad spectrum of antibiotics listed in . The main cellular fatty acids of strain NH52FT are (>1% of total fatty acids) C18:1 ω7c, an unknown fatty acid (eqivalent chain-length of 11.799), C16:0 2-OH, C10:0 3-OH, C16:0, 11-methyl C18:1ω7c and C12:0 3-OH. The major polar lipids are phosphatidylglycerol, phosphatidylethanolamine, an unidentified phospholipid, an unidentified lipid and an aminolipid . This organism was selected for sequencing on the basis of the DOE Joint Genome Institute Community Sequencing Program 2010, CSP 441: “Whole genome type strain sequences of the genera Phaeobacter and Leisingera – a monophyletic group of physiologically highly diverse organisms”. The genome project is deposited in the Genomes On Line Database  and the complete genome sequence is deposited in GenBank. Sequencing, finishing and annotation were performed by the DOE Joint Genome Institute (JGI) using state-of-the-art sequencing technology . A summary of the project information is shown in Table 2. A culture of DSM 24252T was grown in DSMZ medium 514 (Bacto Marine Broth)  at 28°C. gDNA was purified using Jetflex Genomic DNA Purification Kit (GENOMED 600100) following the directions provided by the supplier but modified by the use of a 40 min incubation time. The purity, quality and size of the bulk gDNA preparation were assessed by JGI according to DOE-JGI guidelines. DNA is available through the DNA Bank Network . The draft genome sequence was generated using Illumina data . For this genome, we constructed and sequenced an Illumina short-insert paired-end library with an average insert size of 270 bp which generated 13,912,778 reads and an Illumina long-insert paired-end library with an average insert size of 7,381 ± 2,326 bp which generated 9,786,858 reads totaling 3,555 Mbp of data (Feng Chen, unpublished data). All general aspects of library construction and sequencing can be found at the JGI web site . The initial draft assembly contained 43 contigs in 14 scaffolds. The initial draft data was assembled with Allpaths and the consensus was computationally shredded into 10 kbp overlapping fake reads (shreds). The Illumina draft data was also assembled with Velvet , and the consensus sequences were computationally shredded into 1.5 kbp overlapping fake reads (shreds). The Illumina draft data was assembled again with Velvet using the shreds from the first Velvet assembly to guide the next assembly. The consensus from the second Velvet assembly was shredded into 1.5 kbp overlapping fake reads. The fake reads from the Allpaths  assembly and both Velvet assemblies and a subset of the Illumina CLIP paired-end reads were assembled using parallel phrap (High Performance Software, LLC). Possible mis-assemblies were corrected with manual editing in Consed [42-44]. Gap closure was accomplished using repeat resolution software (Wei Gu, unpublished data), and sequencing of bridging PCR fragments with Sanger technology. One round of manual/wet lab finishing was completed. A total of 43 additional sequencing reactions were completed to close gaps and to raise the quality of the final sequence. 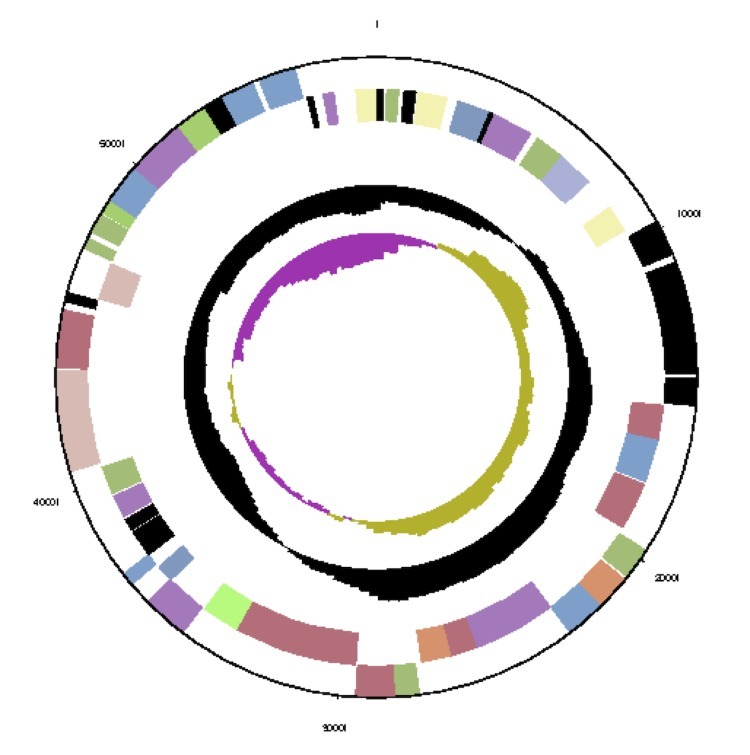 The estimated size of the genome is 5 Mb and the final assembly is based on 3,555 Mbp of Illumina draft data, which provides an average 711 × coverage of the genome. 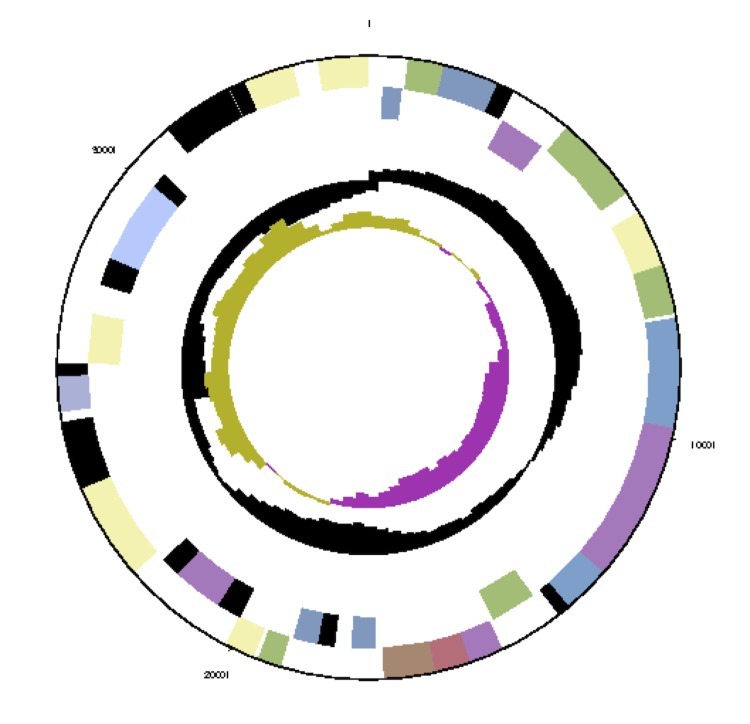 Genes were identified using Prodigal  as part of the JGI genome annotation pipeline , followed by a round of manual curation using the JGI GenePRIMP pipeline . The predicted CDSs were translated and used to search the National Center for Biotechnology Information (NCBI) nonredundant database, UniProt, TIGR-Fam, Pfam, PRIAM, KEGG, COG, and InterPro databases. Additional gene-prediction analysis and functional annotation was performed within the Integrated Microbial Genomes - Expert Review (IMG-ER) platform . The genome consists of seven scaffolds with a total length of 4,948,550 bp and a G+C content of 60.7% (Figures 3a, 3b, 3c, 3d, 3e, 3f and Figure 3g, Table 3). The scaffolds correspond to a chromosome 4,411,177 bp in length and six extrachromosomal elements. Of the 4,896 genes predicted, 4,832 were protein-coding genes and 64 RNAs. The majority of the protein-coding genes (81.1%) were assigned a putative function while the remaining ones were annotated as hypothetical proteins. The distribution of genes into COGs functional categories is presented in Table 4. 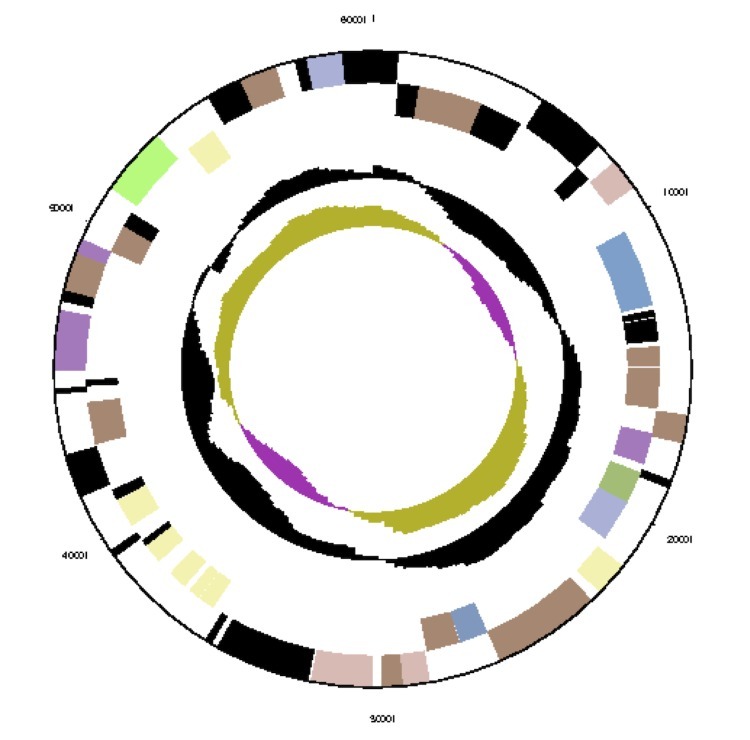 Graphical map of the chromosome (cNanh_4411). From outside to the center: genes on forward strand (color by COG categories), genes on reverse strand (color by COG categories), RNA genes (tRNAs green, rRNAs red, other RNAs black), GC content, GC skew. Graphical map of the extrachromosomal element pNanh_A236. From bottom to top: genes on forward strand (color by COG categories), genes on reverse strand (color by COG categories), RNA genes (tRNAs green, rRNAs red, other RNAs black), GC content, GC skew. Graphical maps of the extrachromosomal element pNanh_B92. From outside to the center: genes on forward strand (color by COG categories), genes on reverse strand (color by COG categories), RNA genes (tRNAs green, rRNAs red, other RNAs black), GC content, GC skew. Graphical maps of the extrachromosomal element pNanh_D58. From outside to the center: genes on forward strand (color by COG categories), genes on reverse strand (color by COG categories), RNA genes (tRNAs green, rRNAs red, other RNAs black), GC content, GC skew. Graphical maps of the extrachromosomal element pNanh_F35. From outside to the center: genes on forward strand (color by COG categories), genes on reverse strand (color by COG categories), RNA genes (tRNAs green, rRNAs red, other RNAs black), GC content, GC skew. Graphical map of the extrachromosomal element pNanh_E56. From left to right: genes on forward strand (color by COG categories), genes on reverse strand (color by COG categories), RNA genes (tRNAs green, rRNAs red, other RNAs black), GC content, GC skew. 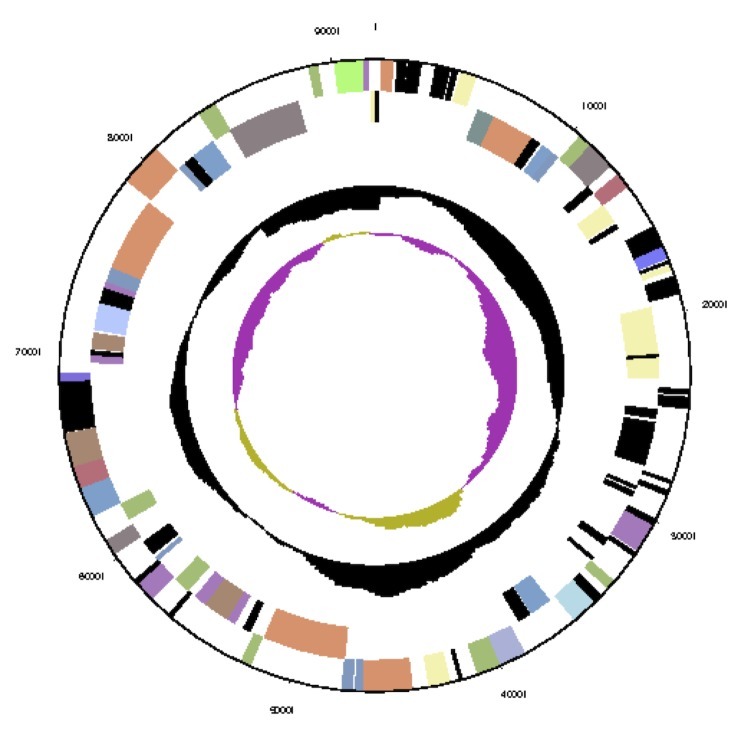 Graphical maps of the extrachromosomal element pNanh_C61. From outside to the center: genes on forward strand (color by COG categories), genes on reverse strand (color by COG categories), RNA genes (tRNAs green, rRNAs red, other RNAs black), GC content, GC skew. The replication-initiation systems identified on the scaffolds were as follows: cNanh_4411, dnaA, repB-I and rep ABC-2; pNanh_A236, repABC-5; pNanh_B92, dnaA-like and repA-d; pNanh_D58, repABC-9; pNanh_F35, repA-a; pNanha_E56, repA-b and repA-c; pNanh_C61, repA-I. This justifies the interpretation of cNanh_4411 as circular chromosome and of the other scaffolds as circular extrachromosomal elements [49,50]. Genome analysis of L. nanhaiensis DSM 24252T also revealed the genes for the utilization of methylated amines (MAs). The key genes from the proposed pathway of MA metabolism code for the enzymes trimethylamine monooxygenase (tmm) and gammaglutamylmethylamide synthetase (gmaS). The trimethylamine monooxygenase is a flavin-dependent enzyme, recently identified by Chen et al. . Comparison of a previously published sequence for a trimethylamine monooxygenase gene in L. nanhaiensis DSM 24252T from Chen  (GenBank accession number JN797867) showed 99% sequence similarity to the gene of a predicted flavoprotein involved in K+ transport in the genome of DSM 24252T (Nanh_04177). Comparison of the gmaS sequence (JN797857) with the genome showed also a 99% sequence similarity to a glutamine synthetase, type III (IMG term: gamma-glutamylmethylamide synthetase, EC 6.3.4.12) (Nanh_04141). These genes give L. nanhaiensis the potential to utilize MAs as alternative nitrogen sources . Interestingly, the genes tmm and gmaS of L. nanhaiensis DSM 24252T do not cluster with the corresponding genes of the other Leisingera species in phylogenetic trees calculated for these genes. The Tmm sequence (~255 amino acids) clusters with Ruegeria pomeroyi and Roseobacter denitrificans, the sequence for GmaS (~264 amino acids) with Ruegeria atlantica and Roseobacter sp. AzwK-3b . Strain DSM 24252T encodes a gene transfer agent (GTA), a virus-like particle that mediates transfer of genomic DNA between prokaryotes without negative effects on the host cell . The GTA cluster has a length of ~17 kb (Nanh_00247-Nanh_00229) and shows structural similarities to GTAs of other Rhodobacterales species, e.g. Phaeobacter inhibens 2.10 and P. inhibens DSM 17395 . (Note that the species affiliation of P. gallaeciensis and P. inhibens strains had recently been reassessed, resulting in the assignment of the alleged P. gallaeciensis type-strain deposit DSM 17395 to P. inhibens .) Strain DSM 24252T also harbors a putative prophage (Nanh_4518 - Nanh_4531). We found all genes necessary for dissimilatory nitrite reduction, including the cluster for nitrite reductase (Nanh_03376 – Nanh_03386), the cluster for nitric oxide reductase (Nanh_03387 - Nanh_03394), and the cluster for nitrous oxide reductase (Nanh_01753 - Nanh_01761). L. nanhaiensis was described as an aerobic bacterium, but only the reduction of nitrate was tested in the original description of this organism . Based on the genomic information we tested strain DSM 24252T for dissimilatory reduction of nitrite, by using anaerobic marine basal medium according to Cypionka and Pfennig  supplemented with nitrite (5mM) and methionine (1mM). Reduction of nitrite was tested photometrically at 545nm after two weeks, using the Griess reaction . The results showed that strain DSM 24252T is able to reduce nitrite under anoxic conditions, demonstrating that it is a facultatively anaerobic organism. Below we propose an according emendation of the species description. Interestingly, the same was found recently for Phaeobacter inhibens T5T , which also was initially only tested for the reduction of nitrate and thus described as a strictly aerobic bacterium . A test for nitrite reduction showed, however, that P. inhibens is in fact a facultatively anaerobic bacterium . Based on these findings, we suggest that anaerobic growth of roseobacters should not only be tested with nitrate, but also with nitrite. As indicated by the 16S rRNA gene sequence analysis (Figure 1), the classification of L. nanhaiensis might need to be reconsidered. We conducted a preliminary phylogenomic analysis using GGDC [57-59] and the draft genomes of the type strains of the other Leisingera and Phaeobacter species. The results shown in Table 5 indicate that the DNA-DNA hybridization (DDH) similarities calculated in silico of L. nanhaiensis to Phaeobacter species are, on average, not smaller than those to other Leisingera species. The highest value was obtained for P. arcticus. †Calculated in silico with the GGDC server version 2.0 . The standard deviations indicate the inherent uncertainty in estimating DDH values from intergenomic distances based on models derived from empirical test data sets (which are always limited in size); see  for details. The distance formulas are explained in . The numbers in parentheses are GenBank accession numbers identifying the underlying genome sequences. The accession number of L. nanhaiensis is AXBG00000000. Genome sequencing of L. nanhaiensis DSM 24252T reveals the presence of six plasmids with sizes between 35 kb and 236 kb (Table 6). The circular conformation of the chromosome and four extrachromosomal elements has been experimentally validated. The four larger plasmids contain characteristic replication modules of the RepABC-, DnaA-like and RepA-type comprising a replicase as well as the parAB partitioning operon . The respective replicases that mediate the initiation of replication are designated according to the established plasmid classification scheme . The different numbering of, e.g., the replicases RepC-5 and RepC-9 from RepABC-type plasmids corresponds to specific plasmid compatibility groups that are required for a stable coexistence of the replicons within the same cell . The two small replicons pNanh_E56 and pNanh_F35 contain solitary RepA-IV type replicases without a partitioning module. This distribution may correspond with a higher plasmid copy number within the cell, thus assuring the replicon maintenance in the daughter cells after cell division. The additional RepA-IV type replicase that is located on the DnaA-like I plasmid pNanh_B92 may originate from a fusion event of two formerly independent plasmids. *circularity not experimentally validated; #deduced from automatic annotation. The locus tags of all replicases, plasmid stability modules and the large virB4 and virD4 genes of type IV secretion systems are presented in Table 7. The largest plasmid pNanh_A236 contains a post-segregational killing system (PSK), consisting of a typical operon with two small genes encoding a stable toxin and an unstable antitoxin . Moreover, this RepABC-type plasmid also contains a complete type IV secretion system including the virB operon for the formation of a transmembrane channel. The relaxase VirD2, which is required for the strand-specific DNA nicking at the origin of transfer (oriT), and the coupling protein VirD4 support the presence of a functional conjugation system on this plasmid [64,65]. The presence of the highly conserved chromosomal genes virD2 (Nanh_3787) and virD4 (Nanh_3786), representing the relaxase and coupling protein, respectively, is noteworthy. However, the presence of two genes with an equivalent function on pNanh_F35 (Nanh_0082, Nanh_0080) is indicative for the mobilization of the smallest plasmid. The RepA-I type replicon pNanh_C61 contains a complete rhamnose operon  and it is dominated by genes that are required for polysaccharide biosynthesis. Finally, the presence of CRISPRs (Clustered Regularly Interspaced Short Palindromic Repeats) that provide acquired resistance against viruses  on the 56 kb replicon pNanh_E56 is noticeable. The circularity of this scaffold has not been validated experimentally, but the proven circularity of the chromosome supports the localization of these CRISPRs on a plasmid. †Genes for the initiation of replication, toxin/antitoxin modules and two representatives of type IV secretion systems (T4SS) that are required for conjugation. Leisingera nanhaiensis (nan.hai.en´sis. N.L. fem. adj. nanhaiensis referring to Nanhai, the Chinese name for the South China Sea, from where the type strain was isolated). The description is the same as given by Sun et al. with the following modification: The relationship to oxygen of Leisingera nanhaiensis DSM 24252T is changed from aerobic to facultatively anaerobic. The authors would like to gratefully acknowledge the assistance of Helga Pomrenke for growing L. nanhaiensis cultures and Evelyne-Marie Brambilla for DNA extraction and quality control (both at the DSMZ). The work conducted by the U.S. Department of Energy Joint Genome Institute was supported by the Office of Science of the U.S. Department of Energy under contract No. DE-AC02-05CH11231; the work conducted by the members of the Roseobacter consortium was supported by the German Research Foundation (DFG) Transregio-SFB 51. Garrity GM, Bell JA, Lilburn T. Phylum XIV. Proteobacteria phyl. nov. In: DJ Brenner, NR Krieg, JT Staley, GM Garrity (eds), Bergey's Manual of Systematic Bacteriology, second edition, vol. 2 (The Proteobacteria), part B (The Gammaproteobacteria), Springer, New York, 2005, p. 1. Garrity GM, Bell JA, Lilburn T. Order III. Rhodobacterales ord. nov. In: Garrity GM, Brenner DJ, Krieg NR, Staley JT (eds), Bergey's Manual of Systematic Bacteriology, Second Edition, Volume 2, Part C, Springer, New York, 2005, p. 161. Garrity GM, Bell JA, Lilburn T. Family I. Rhodobacteraceae fam. nov. In: Garrity GM, Brenner DJ, Krieg NR, Staley JT (eds), Bergey's Manual of Systematic Bacteriology, Second Edition, Volume 2, Part C, Springer, New York, 2005, p. 161.